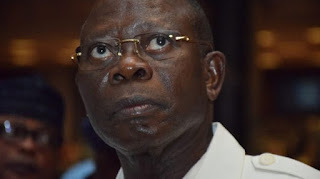 The National Chairman of the All Progressives Congress, Adams Oshiomhole, is expected to face further interrogation at the Department of State Services anytime he returns to the country. It was also learnt that President Muhammadu Buhari was aware of the investigation of the former governor of Edo State by the security agency. It was also gathered that the President was informed by the Director-General of the DSS, Yusufi Bichi, about the desire of the agency to grill Oshiomhole over allegations levelled against him by some aggrieved members of the party. The report quoted Presidency sources as saying that the President actually asked the secret police to “go ahead and do their job” when he was told about the allegations of the party chairman. Elected party chairman less than five months ago, Oshiomhole has been having a running battle with some governors and leaders within the ruling party. The leaders and the governors it was learnt believed that the former governor did not handle the just concluded party primaries across the country well. The governors, especially those who were unable to secure party tickets for their favourite candidates, it was learnt had been mounting pressure on the President to overrule the party chairman on the choice of candidates from their states. According to reports on Wednesday, the DSS grilled Oshiomhole for about nine hours between Sunday and Monday before he travelled out of the county. Security sources confirmed to reporter that Oshiomhole would be expected to return for interrogation on his return to the country. It was also gathered that the DSS was planning to send the report of its investigations to the President alone. "We are still looking at his statements and also carrying out further investigations. This type of operation is not meant for the members of the public.